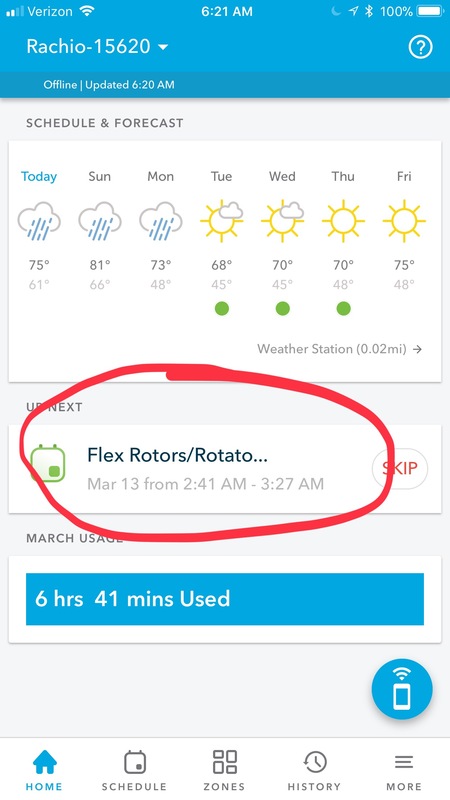 I finally started trying flex daily and began with the setting to finish watering before sunrise, yet it waters at 6pm to 9pm. So then I changed it to manually water only before 8am… And it changed the schedule to water from 9pm to 11pm. Anyone know why this isnt making any sense? Could it have a strange timezone setting somewhere I haven’t found or something? Side note but when I created the schedule I set it to start on a certain date… Totally disregarded and started the day before. For more information this will explain the current behavior. I absolutely agree with everything that is brought up. The perfect functionality requires an enormous amount of state for just one schedule type configuration. Limited on time we went with a stable yet imperfect implementation. Once there is time this will definitely be revisited. 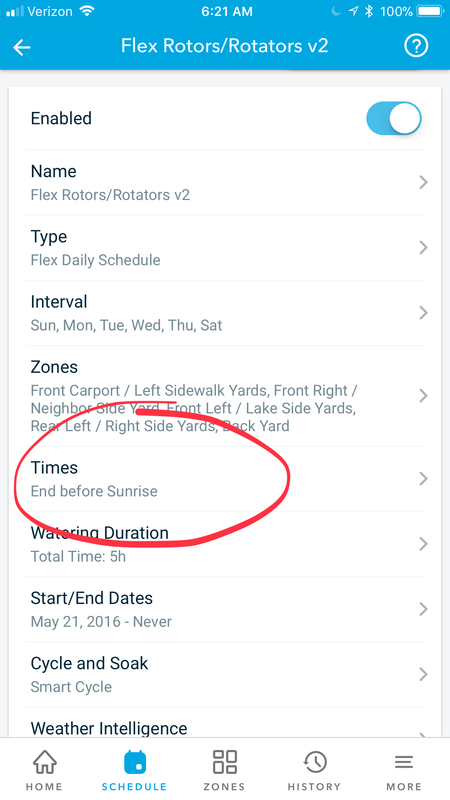 If you really want the start before sunrise option, then start with just one or two zones in your shedule. The start time is calculated without considering which zones will water that day, and assumes all zones may water, hence the very early start time. 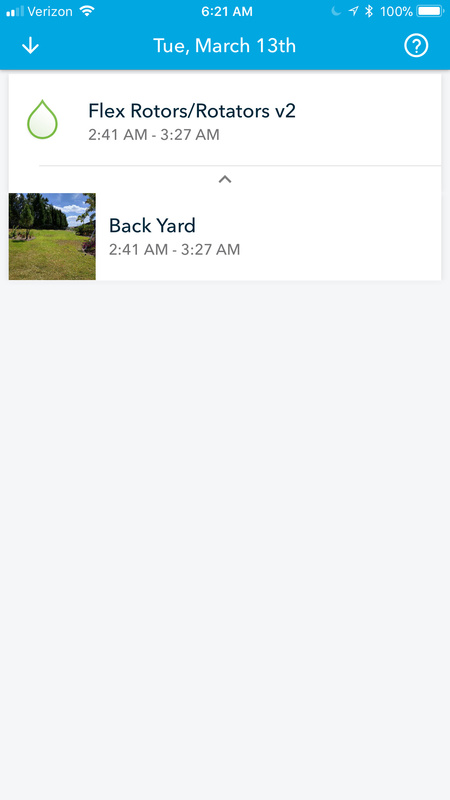 If you only need to water each zone once or twice a week, split your zones across multiple schedules - if not, use a different scheduling option (e.g… fixed start time) until Rachio enhances this feature to consider which zones will water in each run. @jkb My thoughts as well. Multiple schedules. Less zones per, less “max” runtime. No negative impact and closer to desired times. @franz @theflexdude I just moved my flowerbeds to a new Flex Daily. Doing that alone made a significant change to the start time for the lawn zone(s) flex sched. Most days the lawn zones will start at ~3-3:30 AM, much better. However, one new thing I’ve discovered is that because the lawn flex sched. was created before the new one. On days where both Flex Daily’s run the original sched. runs first. Lawn watering starting at about 00:00-01:00 and the flowerbeds after that. Kinda bummed that I’ll have to create a new schedule for the lawn and hope it places the lawn times after the the flowerbeds. Would be nice if we could drag them into an order of precedence.